One of the best things about being a decorator is getting a sneak peek at what's coming next in furniture and accessories. After months of seeing the same old-same old, a visit to trade shows like the High Point Market in North Carolina--with more than 2000 exhibitors from over 100 countries and 10 million square feet of showroom space--shakes up my senses in the most delightful way. Here's some of my fun and refreshing finds from the recent October Market. 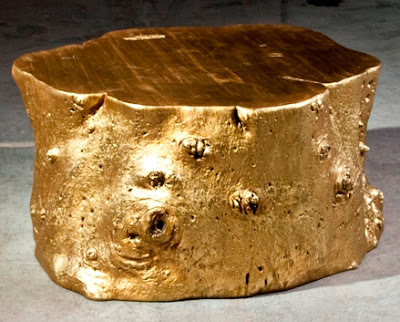 My first discovery came moments after I landed at Greensboro Airport, where a display of metallic-coated Log Tables made of resin fiberglass cast from actual wood stumps caught my eye. Just love how Phillips Collection added a glamorous twist to something so rustic and real. 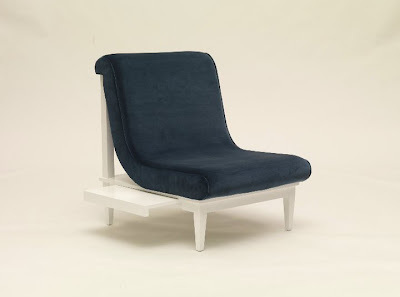 Next I came across The Five O'Clock Slipper Chair, a swanky velvet chair with a hidden slide-out surface on which to perch your cocktail. Genius! Since when designing a room we're always looking to mix the pretty with the practical--and always worried about where you'll put down your drink--it did not suprise me one bit that two former decorators designed this piece, along with a tightly edited collection of similarly surprising furniture. Each piece by Carolina George has some kind of clever twist that elevates it from ordinary to unique. At most of the showrooms, the presentation wows as much as the product, and I always come away with new display ideas. The colorful book spines are one of Decorative Leather Books by-the-yard collections intended for retail displays and model or show homes. But it's a clever DIY idea you could steal for your own library.